If you’ve heard anything about web accessibility, you’ve probably heard of screen readers – devices that allow blind or vision-disabled people to access websites by listening to a speech synthesizer or, in some cases, via a braille display. There are a number of different screen readers; this recent review of three popular screen readers is interesting – the comments in particular illustrate that “accessibility” is different for different users with different needs, an important thing to keep in mind. But I’m not a web designer. Should I care? What does this mean for those of us who don’t design entire websites, but who do write and publish content on the web? Well, for one thing, a giant block of text is going to be a huge pain for someone using a screen reader. Since they can’t quickly scan to figure out what the most important points are, they are going to have to sit and listen to the entire block of text. It would be much easier for these users to break up your content into smaller portions, using heading tags to separate them. You’re not breaking it up at random, of course – more than just controlling font size and weight (for sighted readers), heading tags describe how your content is structured. Think of how an outline works – you have section I, and below that sub-sections A, B, C – then section II, and so on. Headings work the same way. H1 is generally your title, then H2, then on down as far as H4 if your content is that complex – then back to another H2, and so on. Or, think about a book with sections and chapters – or even feature story in the newspaper, which may have a headline and multiple sections, each with its own smaller title or headline. This post, for example, uses heading tags instead of just rambling on and on nonstop. Ta-da! Great news: Structuring your content using these semantically meaningful, well-organized heading tags also makes it easier for sighted users to scan your page and quickly spot the content they are looking for. 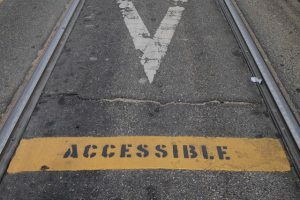 This is a recurring theme that you find once you start learning about accessibility: many of the measures you take to make your website usable for disabled users are actually usability improvements for most of your users. This is true of accessibility features in the offline world, too – the button that lets someone using a wheelchair open a door is also helpful for a non-disabled (I love the term “temporarily able-bodied“) person whose arms are full of packages. The thoughtful folks over at GOV.UK (run by the Government Digital Service, the group responsible for designing digital services for the UK government) recently published a great post, “How to create content that works well with screen readers.” They don’t offer a bulleted to-do list, but rather discuss how screen readers work and some of the potential implications for writers of web content. For example, it’s useful to think about how screen readers interpret acronyms. It shouldn’t come as any surprise that this article concludes that writing content that works well for everyone will benefit screen reader users. Proofreading your content to make sure words are spelled correctly and using consistent standards for how you deploy acronyms and abbreviations, for example, will benefit everyone. Of course, blind and vision-disabled users aren’t the only people with disabilities who use the web. People with color-blindness, deaf or hard-of-hearing people, people with limited fine motor control or who have difficulty using a mouse, and people with cognitive or memory disabilities can all have a better experience on the web if content is thoughtfully designed. 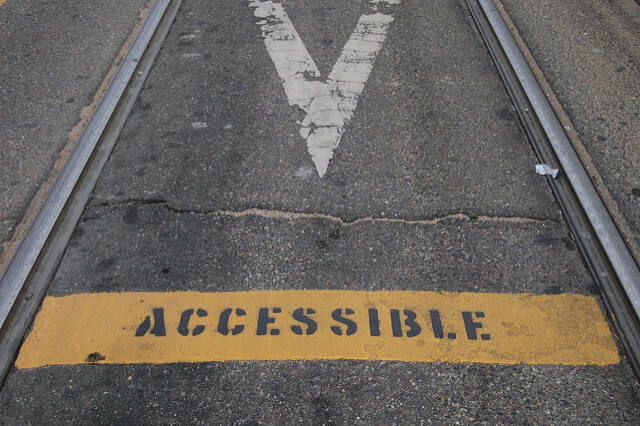 If you find yourself intrigued by these issues, WebAIM’s Introduction to Web Accessibility is a great place to start. For IU-specific accessibility information and some great resources to help you create accessible content, visit Accessibility at IU. The UITS Assistive Technology & Accessibility Center, conveniently located in the Wells Library, has tremendous expertise in web accessibility and is available for consultations, trainings, and presentations. And we in DUX are always happy to answer – or find an answer to – any specific questions you might have! Note that captioning your video content doesn’t have to be hard or even done by you! YouTube has built-in crowd-sourcing capabilities for this; I myself have entered the captions for many videos, including but not limited to my favorite vlog, SciShow. Great info, Spencer – thanks!